Cho Chikun has reached the semi-finals of the 8th Samsung Cup. It makes me wonder whether he is back on his way to the top. The fact alone that he is in the semi-finals is a bit remarkable, because he has never done very well in international tournaments. He has only won one, the 4th Fujitsu Cup in 1991, and that victory was not a perfect one: his opponent Qian Yuping for the final could not play because he was too ill.
What probably pleases his fans most, is that in the quarter-final he finally won another game against Cho Hun-hyeon. That has not happened since 1981! This must have been a very significant victory for Chikun. See below. The semi-finals will be in November 2003, 4,5 and 7, best of three matches. The other players are quite young: Hu Yaoyu (21), Xie He (19) and Pak Yeong-hun (18). Cho is 47. What a contrast! Hu Yaoyu (7d) is Cho's opponent in the semi-finals. Hu learned to play Weiqi at age 6 and reached professional shodan at age 11. The same age as when Cho became pro, so we have two former child prodigees in this mini-match... Hu has yet to win his first title, but he is certainly very strong. Recently he beat five top players in a row in the 4th Nongshim cup, before finally losing to Yi Ch'ang-ho. Among his scalps were Yoda, the current Meijin, Kato, the current Honinbo, Kobayashi, the current Gosei and Cho Hun-hyeon. Not a young man to underestimate. A formidable opponent. Screen captures from the KBS Satellite TV coverage (more than 8 hours!) of the quarter finals. 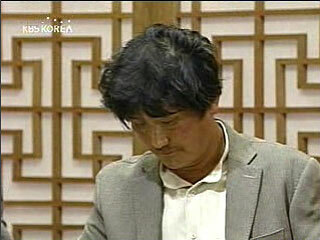 Cho Hun-hyeon was already clearly the top player of Korea in 1981. In fact, in June 1980 he held all of the major titles in Korea. But Cho Chikun was the publics' favourite and when he visited Korea after his first major title (the Meijin) in Japan, he was received as a national hero. The two Cho's played two games then, on December 31st and two days later, January 2nd 1981. Chikun won both. This was really a blow to Hun-hyeon. The public (wrongly) assumed that Korean Baduk was not yet up to the level of Japanese Go. Hun-hyeon must have vowed that he would never lose another game against Chikun. 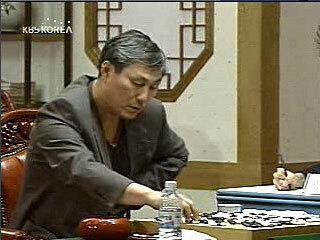 Which in fact he did: between 1981 and 2003 they played seven games and Hun-hyeon won all of them. For more details of this story, see gobase.